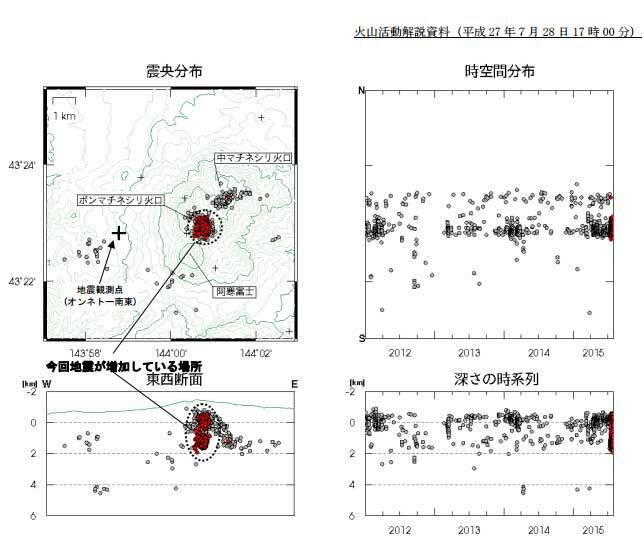 A swarm of shallow volcanic earthquakes under the Ponmachineshiri crater of Mt Meakan volcano has been occurring since yesterday. This event triggered the Japanese Meteorological Agency (JMA) to raise the volcanic alert status to 2 (eruption alert, on a scale of 1-5) today. In addition, temperatures and fumarolic activity inside the crater have increased. The earthquake swarm follows a gradual increase in seismicity under the volcano noted since April this year. JMA thinks the most likely outcome is a very small (phreatic) eruption in the near future and recommends not to approach the crater within 500 m.